Quollity habitat is the key for the survival of the western quoll. They are beautiful animals – marsupials actually, which means they have a pouch for their young. They have a pointed snout, a long tail and brown to black fur with beautiful spots of white. They might be beautiful, but these introverts definitely don’t flaunt it as they live solitary nocturnal lives. The western quoll is found only in a small area in the southwest of Western Australia. Once they ran around all over central and southern Australia, east of the Great Divide in every mainland state but now the western quoll today survives only in the far south-west of Western Australia, living in jarrah forests, drier woodlands and mallee shrubland. Quolls eat meat. They are one of the few top order predators in the Australian bush. The western quolls eat mainly insects, birds, frogs, lizards, snakes, small mammals and fruit. Quolls sometimes scavenge dead animals and hang out around campsites and rubbish bins doing some dumpster diving. Quolls go to the toilet at the same spot – open spaces such as rock ledges. We guess for hygiene reasons – they don’t want to spoil their beautiful coats – but for communicating and marking their territory. It only takes a year for quolls to be able to start breeding. This is a necessity given that they don’t live long – an average of two years. Once they are too big for the pouch mum leaves them in a nest, occasionally transporting them on her back when they move dens. Finally, the young wean after about 6 weeks in the nest. The western quoll is on the edge because historically we haven’t been very kind to them. In the past we have actively hunted them, we destroyed or changed the places where they live and the foxes and cats we introduced kill and compete with them. What is our vision for them? • $50,000: Quollifying the Little Desert Nature Lodge: In order to house and breed the western quoll we need to upgrade and improve our facilities to suit these agile escape artists. • $100,000: Bringing Western Quolls back to Victoria: With this amount of money we can import breeding animals from their stronghold in Western Australia, start the breeding program, develop and education and engagement program, and begin a pilot reintroduction program within our predator proof enclosures. We can empower community involvement and volunteering. 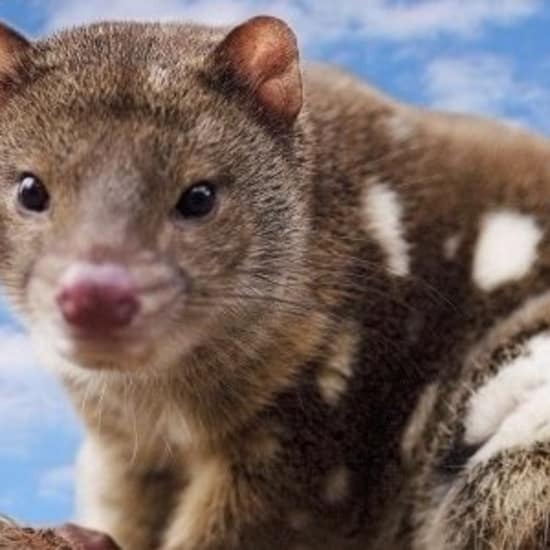 • $500,000 +: Returning Western Quolls to the Wimmera Desert: This is the Full Monty. With this kind of support we can do the necessary hard work with all the relevant stakeholders managing threats and resorting the landscape to a point that we can reintroduce these guys to the ecosystem and then monitor and evaluate the outcomes.